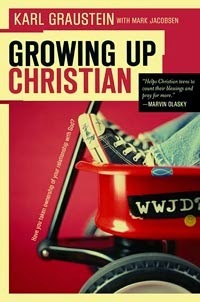 Here is a section from chapter one of Growing Up Christian. Growing up in a Christian home is a wonderful privilege. Church kids have been given so much: godly parents, training in the Word of God, friends from Christian homes, support from a Christian church community, and most importantly an opportunity to know God at a young age. Throughout our lives, we are repeatedly taught about the love of God, his plan of salvation, ways to recognize and resist sin, and living for the glory of God. Not only are church kids given much, we are also protected from much. Our God-fearing and loving parents wisely limit our entertainment options—television, music, movies, books, and magazines. They carefully monitor our friendships and our exposure to the message of the world. We learn about the lies of secular values and other religions. We are trained to evaluate all of life according to the standards of Scripture. Daily, I benefit from years of being taught the truths of Scripture and from countless hours of reading the Word. My parents have provided for me a clear example of living all of life for the glory of God, maintaining a strong marriage, and raising children. Because of faithful training by my parents, teachers, and church leaders, I have not had to break many bad habits and regret years of godless living. I have a friend who became a Christian at the age of 41. He is determined to live every moment of his life for God because he feels like he wasted his first 41 years. My friend wishes he had the opportunities that the young people in his church have. He sees how they know more about God than he does and are only a third of his age, and he gets excited about the difference these church kids will make for Christ as they move into adulthood. When I think that I have lived almost 40 years as a Christian and (Lord willing) may live another 40 years, I’m amazed at God’s love and kindness towards me. It truly is a great blessing to be a church kid.